As the days get shorter and the temperatures drop, it's easy to gravitate toward the need to hibernate. But you are not a bear. Adults and children need to stay active all year long. Yes, it can be tough to get motivated when the wind is howling or the snow is blowing, but don't give up all thoughts of staying active—indoors or out. A little planning will help you get through the winter months ahead. Whether you're not a fan of the cold or don't appreciate the grey skies or lack of color that winter brings, try instead to think of the things you do like about the season—hot cocoa around the fireplace, brilliant bluebird skies on a chilly day, building snowmen, snowshoeing, snowboarding. If you go in with an attitude of "It's too cold," you are setting yourself up for failure. Attitude is everything. The saying, "There is no bad weather, only bad clothing choices," is absolutely true. If your kids want to stay active outside when the temps drop, make sure they have the right clothing. The best approach to dressing for outdoor activity is with layers. Layering provides the most effective way to stay warm and dry. Plus, you can remove the top layer if you get too hot. The layer closest to the skin should allow moisture to be wicked away; avoid cotton because once it gets wet, it tends to stay wet. The outermost layer should be both wind- and water-resistant. Now that your kids have the right layers and the right attitude, head outside! If you live in an area that gets snow, spend some time sledding. The feeling of flying down a hill and then having to trudge back up over and over again is a great way for your kids to burn off some extra energy. Or, hit the backyard to make a snowman. Beach toys are just as fun in the snow as in sand. Have your kids use buckets and other sand toys to make snow castles. Go on an adventure that's part hiking and part treasure hunt in search of hidden items you can track via GPS coordinates. Visit Geocaching.com and type in your home address (or the address where you plan to walk or hike) to find a few geocaches stashed in the area. Plug in the coordinates into a GPS or on your smartphone and head out with the family to find the treasure. Kids love finding the hidden gems. Just be sure not to take it with you—leave it for the next little treasure hunters to find! Pick a winter sport that the whole family will enjoy. 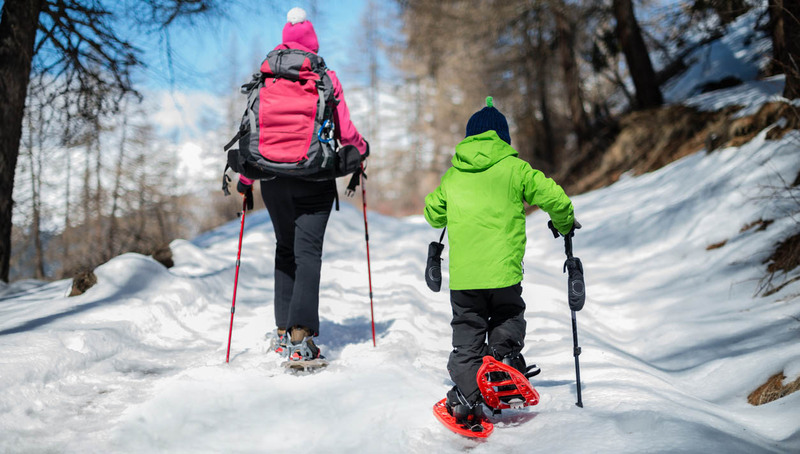 Sign your kids up for ski lessons (downhill or cross country), snowshoe or try out ice skating if they don't already know how. They can even join an indoor basketball or soccer league; not every activity in the winter has to revolve around snow and ice. Take one day out of the weekend and make it an activity day. Go hiking, ride bikes on a new trail, go to a rock climbing gym, visit an indoor trampoline park, go bowling or try out a ropes obstacle course. Make a habit of going for a walk of any distance before or after dinner. Even strolling around the neighborhood block with the family gets in much-needed exercise without it feeling like a task that has to be completed. Plus, it's a great way to catch up on the events of the day and to get in more activity as a family. When the winter cabin fever hits, push the living room furniture out of the way and make a dance floor for everyone do dance their hearts out. It's a guaranteed way to shake the winter blues away!